Jeremy Trent, right, coached Swartz Creek to a Flint Metro League championship in 2010. It was just a short stint of summer ball at Lake Fenton High School between coaching stops for Jeremy Trent. The former head coach of Swartz Creek, who resigned in the winter shortly after the Dragons lost in district play to rival Fenton, will be the new head coach of Flint Powers Catholic. Trent took the Lake Fenton job this spring and coached the Blue Devils in summer ball including a trip to team camp at Hope College. He answered the call from Powers and, after what he described as a very difficult decision, chose to take the reins of one of the state’s best high school basketball programs. Trent replaces veteran head coach Tim Herman who left Powers after amassing a record of 120-34 and winning a state championship in 2009. Trent’s career record is 119-58 and is probably best-known for his resurrection of the program at Bentley, a longtime laughingstock in the sport prior to compiling a 76-38 record in five seasons with the Bulldogs. Powers will, as is tradition, start their season in early December against Flint Northwestern. Flint Beecher point guard Monte Morris, who recently committed to Iowa State University, is one half of what may be the best AAU backcourt in the country. Alongside University of Michigan commit Derrick Walton, the Michigan Mustangs were the unlikely winners of the Adidas Super 64 Tournament in Las Vegas on Sunday. The game, which was televised nationally on CBS, was competitive throughout though the Mustangs were clearly more talented than New Heights (NYC). The Mustangs won the title 84-71, capping off an undefeated week in Vegas. Morris actually sent the Mustangs to the finals with a last-second shot in the semis. For what it’s worth, Michigan’s somewhat enigmatic sponsored AAU program (rare to see them compete in state), The Family, lost in the semifinals of the GRBA National Championships in Fort Wayne to the Illinois Attack. Clearly the title of best U-17 team in Michigan this season goes to the Mustangs, who actually lost to the Family early in the season. The clearest sign that the Mustangs were the top dogs in Michigan came in May, when The Family pulled out of the championship game versus the Mustangs at the Spiece Run ‘n’ Slam citing cramps. The Mustangs’ victory is a clear point of pride for basketball fans in Michigan, since many believed the glory days of were all but over. The Class of 2013 in Michigan has brought the state back to prominence nationally. 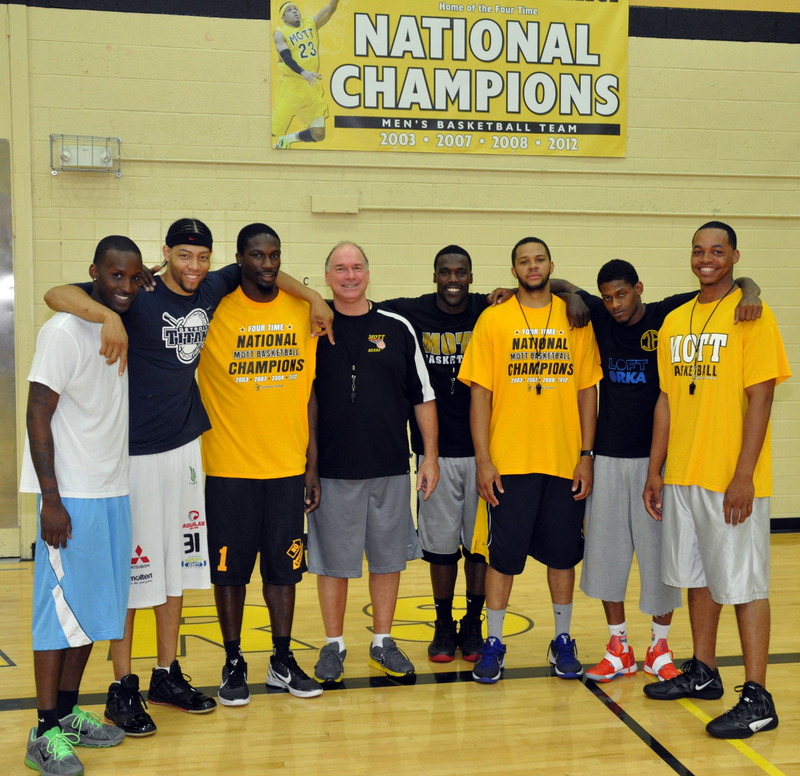 A group of former Mott Community College basketball players came back to Flint this week to help their former coach, Steve Schmidt, run the second session of the popular “No Excuses” basketball camp for kids. The third of four sessions begins on Monday. Click here for more information on the camps. Pictured are seven former Bears now playing professionally, or preparing to play, overseas. The second-annual Bankhoops.com All-State Minicamp will be held Friday, Aug. 3 at the state’s premiere basketball-only facility, The Cage in Swartz Creek. It provides instruction from high school and college coaches and college players, and evaluations and exposure from Bank Hoops, the leading scouting service in Michigan with 150 college clients nation-wide. The underclassman camp is for boys entering grades 8-10, and is geared at getting them ready to be competitive varsity players. For parents, there will be a presentation on the NCAA recruiting process from Childress Sports Consulting. Bank Hoops camp alumni have gone on to play at schools such as: Albion, Alcorn State, Allegheny, Alma, Aquinas, Bucknell, Butler, Calvin, Central Michigan, Chowan, Cleveland State, Columbia, Concordia, Cornerstone, Delta, Denison, DePauw, Detroit, Eastern Michigan, Ferris State, Gardner-Webb, Goshen, Grand Valley State, Hillsdale, Hope, Illinois Tech, Indiana Tech, Lake Forest, Lake Superior State, Lehigh, Madonna, Marygrove, UMass-Lowell, Michigan, UM-Dearborn, Michigan State, Michigan Tech, Minnesota-Duluth, Mott, Mount Vernon Nazarene, UNC-Greensboro, Northwood, Oakland, Olivet, Olivet Nazarene, Palm Beach Atlantic, Penn, Pitt, Rochester, Saginaw Valley State, Saint Anselm, Siena Heights, Spring Arbor, Texas Southern, Toledo, Trine, Trinity Christian, Wagner, Wayne State, West Liberty State, Western Michigan, Wilberforce, William & Mary, Williams, Wooster and Wright State. The camp is covered in depth with player profiles appearing at Bankhoops.com and MLive.com. The camp fee is $100 per player. Lunch and jerseys are provided. GRAND BLANC, Michigan — The thrill and competitiveness of 3-on-3 basketball will hit downtown Grand Blanc on August 4. The tournament will take place on Grand Boulevard between Grand Blanc and Reid Road. The 2012 Grand Blanc Roundball will provide a competitive and family friendly experience for participants and spectators alike. The tournament will welcome all ages but will be limited to the first 125 teams registered. If you’re interested in sponsoring or participating in the Grand Blanc Roundball please visit MIRoundball.com or Facebook.com/MichiganRoundball. Mott Community College head coach Steve Schmidt went into the farthest corner of the lower peninsula to sign a promising high school guard with some upside potential. Myles Busby, a 6-4 and 190-pound shooting guard from Niles High School, is among the top players in Michiana (yes, that’s what they call it down there). He’s one of a pretty impressive crop of guards coming through southwest Michigan including Dontel Highsmith and Josh Kozinski — a pair of D-1 locks. Busby was a big reason Niles finished 19-5 and won the Class A district title. The fourth-year regular averaged 13.1 points, 9.5 rebounds, 3.2 assists and 2.3 steals. Busby was a 46 percent field goal shooter and hit 72 percent at the free throw line. Busby scored 17 points in Niles’ district-opening victory over then two-time defending class A state champion Kalamazoo Central back in March. He was honorable mention class A all-state in his junior and senior seasons. 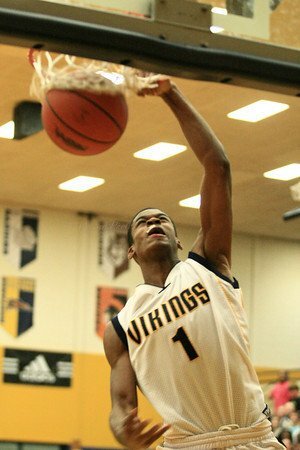 Busby joins an impressive 2012 recruiting class that is starting to emerge at Mott, including Chicago Curie’s Devin Foster, Holland’s Coreante Deberry, Flint Beecher’s Antuan Burks, Detroit King’s William Abbott and Toledo (Ohio) Springfield’s Chester McFadden.